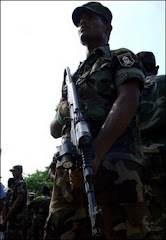 Permanent security checkpoints in and around Colombo have been abandoned and security forces manning them have shifted their positions in keeping with a Supreme Court ruling last week. The Supreme Court in a fundamental rights case judgment ruled that the permanent security checkpoints were illegal. Petitioner, V. I. S. Rodrigo, had said he was harassed and unlawfully detained on trumped-up charges by police officers manning a permanent check post at Kirullapone in Colombo. Subsequent to the judgment, troops manning permanent checkpoints, some of which were highly fortified, abandoned them and resorted to sudden checks. In Colombo and suburbs, security forces were seen carrying out checks as usual a few metres away from the now-abandoned checkpoints. Military Spokesperson Udaya Nanayakara told The Sunday Times that the new system had its pros and cons. "The advantage is it enables us to change positions on the road. There is unpredictability and an element of surprise when we shift places. “But the disadvantage is that troops will not be protected by sandbags in case of an attack," Brigadier Nanayakkara said. As a result of last week’s court ruling, the Defence Ministry’s move to equip key checkpoints in the city with CCTV cameras has come to a halt, The Sunday Times learns. Questions are now being asked whether the government will cancel the tender for the supply of CCTV cameras. Chief Justice Sarath N.Silva with Justices (Ms) Shiranee Thilakawardena and Jagath Balapatabendi agreeing observed that guidelines specified in the documents to officers of checkpoints could not possibly serve any purpose from the perspective of national security.